Skeleton Bay - the home to a fever of rays, alongside the reef's smaller sharks. Enjoy a real hands on experience in the UK's only Tropical Interactive Pool, where the shrimps and other creatures will be more than obliged to give you a manicure! The education deck - where talks about Sharkbait Reef's underwater residents take place. Ocean Tank Tunnel where you can meet the inhabitants on their own level. Guests travel through a glass tunnel which takes them along the tank floor, beneath thousands of gallons of water filled with Sharks and other species. View over 200 different species of fish and creatures, including rays, eels, sea-horses, and sharks! Built on the site of the old 3D Cinema, Sharkbait Reef opened in 2009, a year after the rest of the Mutiny Bay. The addition bought SEALIFE to Alton Towers, inviting guests to take a trip through the depths of our ocean, and gaze in wonder at the amazing sea creatures on display. For the 2010 season the park added a Th13teen themed tank within Sharkbait Reef. Boasting yet more fish and creatures this tank was even complete with its own mini Th13teen rollercoaster. The tank still exists today, home to some of the creepier fish in the bay but coaster model was later removed. 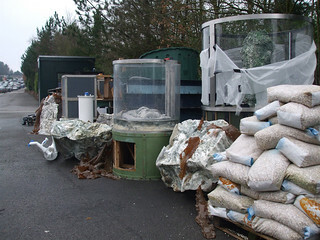 2011 saw twelve new Japanese Spider crabs make the Alton Towers Resort their home, in a new area of the SEALIFE Centre known as Skeleton Bay, taking over the tank which had been home to the centre's spotted rays. The crabs only survived a year, before the rays returned.